This work has finished ahead of schedule and the elevator is in service. 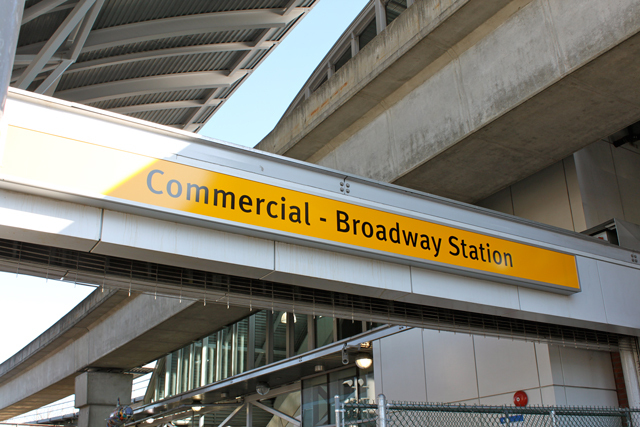 Upgrades to Commercial–Broadway Station are well underway. The next phase of construction will start next week, with crews completing necessary upgrade work on the elevator. From March 6 to April 3, the south elevator to platforms 3 and 4 will temporarily close for demolition and construction in the elevator machine room. Current elevator code restricts work in the machine room, while the elevator is in service. The existing elevator on the north side of the station, and all escalators will continue to be in service. How do I get to the other elevator? From the platform, elevator users will have to cross the overhead walkway over Broadway and take the elevator down to the concourse level, and cross the street, if needed to access the south (Safeway) side of the station. From street level, customers can use the north station entrance (next to Shoppers Drug Mart), tap at the fare gates and access the north station elevator. Passengers requiring assistance can use the red emergency phone or ask for assistance from a SkyTrain attendant. Signs are posted throughout the station and at station entrances to let customers know about this temporary change. Assembly and installation of an enclosure within the machine room. Partial demolition of walls and floors. Installation of new elevator equipment. When complete, the larger machine room will contain new equipment to power one additional elevator that will provide service between the new platform and the concourse. Why are we doing this work during service hours? Completing work when the trains aren’t running will only provide a few hours of work time. If we complete this work for a few hours each night, it will delay overall construction at Commercial-Broadway Station. A delayed work schedule would have a significant impact on our customers. Building an enclosure in the elevator room allows crews to work and still provide service to the elevator. The other option meant closing the elevator for six months while the construction in the machine room was complete. We recognize that this is a major impact to our customers and we thank everyone for their patience while we improve Commercial–Broadway Station. You can find more information about this upgrade work at translink.ca/commercialbroadway. Metrotown loop truss is going up! New escalators at Metrotown SkyTrain station are now in service! Is the date for installing the new Broadway overhead walkway for the new platform known yet? Hi Andrew, thanks for your question. Installation work of the overhead walkway will take place this summer and so, we expect the walkway to open in spring/summer of 2018. Thanks again!